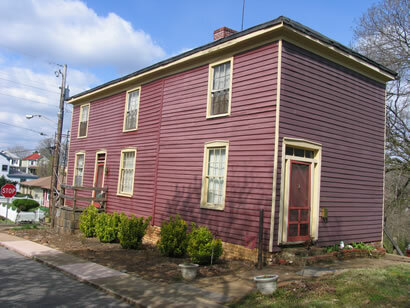 This house is of Colonial Vernacular and is the second oldest house in Lynchburg. It was built in 1787 by John Lynch, the founder of Lynchburg, as part of his farm. The original house consisted of four rooms (two-over-two with center hallway, plus two rooms in the basement serving as the kitchen and dining area). In 1875 Thomas Cartmell added two rooms, one-over-one, to the end of the house creating the present day size room dwelling. In 1852 John Hollins purchased the property from Ammon Hancock and deeded the house to the First Baptist Church to be used as a parsonage. The millstone embedded in the sidewalk came from the original Hollins Mill and dates to the 1700s.